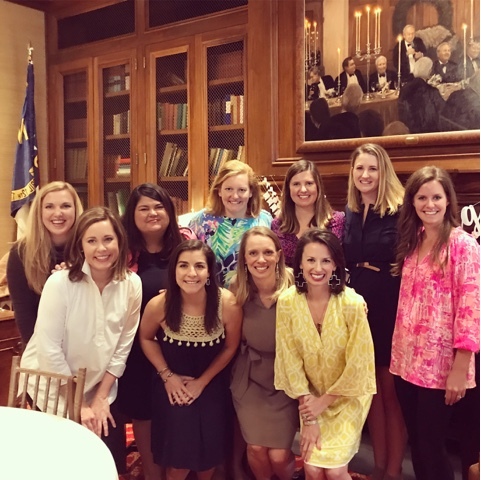 This past Sunday my girlfriends and I gathered to shower our friend Lauren with love, support, and pink frilly ruffled GIFTS as we all prepare for her daughter's arrival in December! The mama-to-be is in the back row under the corner of the painting. She is so excited to become a mommy, and her family is so thrilled as well! For the meal, we had the most delicious bowl of she-crab soup followed by a salad with grilled chicken and figs. I absolutely love figs on a salad. As a special surprise for dessert, they had a handmade donut bar with four different types of donuts! The chef was making the donuts right then and there for us. Paired with hot coffee, it was the cutest little shower idea. Genius, right? I wore an Alice + Trixie dress that's a favorite along with earrings made by my sister, Laura Cox Designs. She's down to one pair left in her Etsy shop HERE. 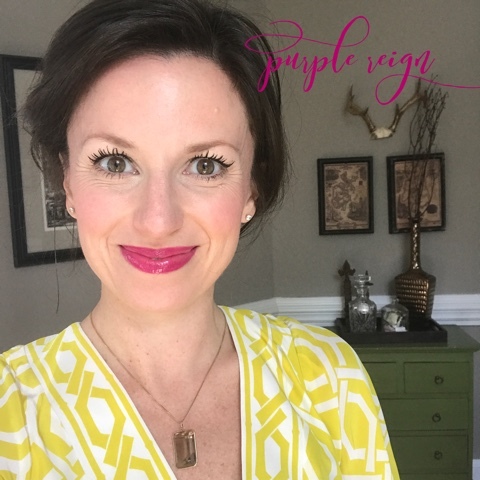 And ever the LipSense fan, I broke out my very fun tube of Purple Reign for a nice bold pop of color! Bright colors for a beautiful, girly day! Please click HERE if you want to see more colors I've been wearing recently. She received so many great gifts including toys, books, sweet little outfits, some nursery decor, a handmade blanket and handmade quilt, and some much-needed baby gear. I gave her a muslin swaddling blanket, a soft little lovey, a monogrammed ruffled bib, and a bow holder I made with a set of four monogrammed hairbows. It was a great day with girlfriends, and I can't wait to meet our littlest new girlfriend in a matter of weeks! Homemade donuts are such a fun idea for a party or shower. Hope you have a wonderful Wednesday!